Welcome to another First Kiss Friday! Today’s guest is Cathy MacRae and her first kiss scene from The Highlander’s Crusader Bride. Happy reading and enjoy! Excerpt: Doomed to a marriage of expedience, Arbela and Caelen have sought their separate ways since their wedding night. But as they learn to live in each other’s presence, an unintended passion grows. “Oh? What is that?” Arbela wracked her brain to remember, unwilling to give him the upper hand. His fingertips barely grazing her chin, he tilted her face up to his. “I admit to wanting to kiss ye,” he murmured. His lips moved softly against hers, questioning, seeking. Arbela drew a shallow breath, all her lungs would hold, and pressed upward on her toes as sparks raced through her body. Though she’d tried to forget, told herself it was futile to dwell on their wedding night, she could not deny the pleasure of his touch. Caelen’s hands clasped her waist, pulled her close. His lips slanted hungrily, a faint growl low in his throat. Arbela slid her hands between them, palms against his chest. Caelen broke the kiss, but would not let her pull away. “Where does this take us?” she murmured, relishing the feel of his arms about her despite her misgivings. “I believe ’tis a grand thing for a husband to love his wife,” he offered. Arbela leaned back. “Are ye prepared for where this could lead?” she asked. “I believe I am aware of how this works,” he commented wryly. “’Tis a wonder ye married me,” Arbela quipped, trying desperately to cover her disappointment at the picture he painted. DD MacRae enjoys bringing history to life. Research is one of the best things about writing a story! And with more than 35 years of martial arts training, DD also brings believable, breath-taking action to the tales. 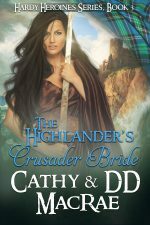 You can connect with DD through www.cathymacraeauthor.com. It’s always exciting to hear from readers! You’re very welcome any time! This excerpt is great. I love it when there is intelligent interaction between the characters. I’m definitely going to have to get this book to see what happens! Thank you for totally capturing my imagination , Cathy and DD ! Oh my! This sounds fantastic! Definitely got my interest! Thank you both and have a great weekend! !